If you like your food and especially if you like trying new food then today’s post should be up your street. People when they think of Valencia think of a large,lively and fun city on the Mediterranean east coast of Spain,with some nice beaches and a few orange groves. Well,that is part of what Valencia is, but forget, for a moment, that image because Valencia has another, and in many ways, a much more interesting facet to it. And more so, if you like discovering and searching out new gastronomic experiences. It has an interior region which is often mountainous and wild. Besides being a city and a province,Valencia is a Comunidad Autónoma which is made up of three provinces,Valencia,Alicante and Castellon which includes a whole spectrum of microclimates and local cultures. 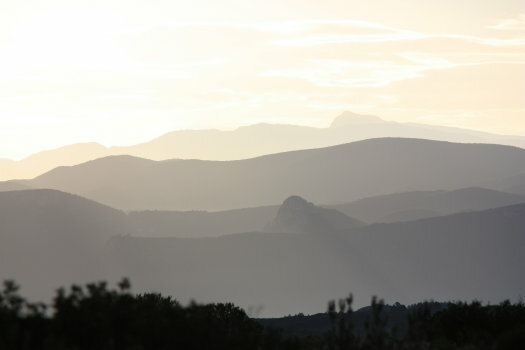 This large interior region is a mix of wild mountains,fertile valleys,and historical towns and villages.More importantly, the weather in the winter can be cold and this winter climate in the more mountainous regions of the Sierra de Mariola, and the the areas around Enguera,Fontanares and Ayora has helped develop some very unique and tasty food into being part of the local culture. It’s a rugged area which is famous in this part of the world for wine. 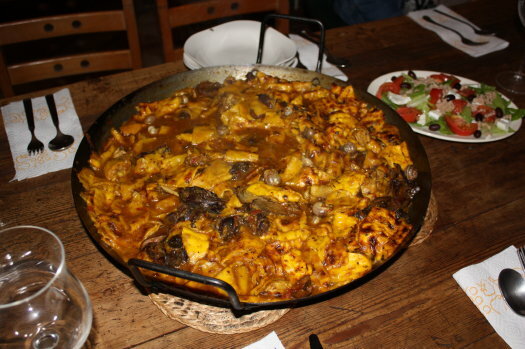 wild mushrooms,olives,arroz al horno(oven rice) and many more dishes.Its ruggedness and mountains mean that wildlife and the cold were part of everyday winterlife and helped formulate the dish that,today, I am going to tell you about. It is a relatively obscure dish which although commonplace in these areas is not normally that well known in other parts. 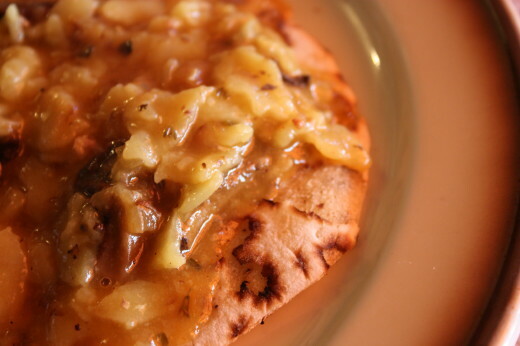 It is a dish which is a truly unique and memorable gastronomic experience. It is “Gazpachos”. 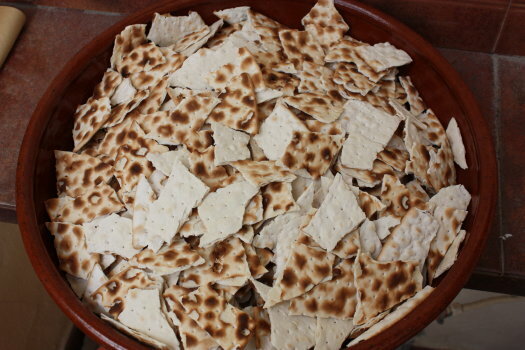 You can use unlevened bread or these kinds of cracker/Matsos bread. Now,I can hear people saying, “Gazpacho? Isn’t that a cold tomato soup with a bit of garlic?” Well yes, but this dish is called “Gazpachos” in plural and it is only common to this very rural and often very mountainous area that borders Alicante,Valencia,Albacete, and Teruel.I love this dish because it so good and because it knows no greographical barriers and is common in these places even though in many other ways these places are totally different in culture and customs. Gazpachos unites these areas into a unified gastronomic fiefdom. The Kingdom of Gazpachos!! I also love that it is seasonal. It is a dish logically designed for cold wintery days and a perfect way to finish off a walk in the sourrounding rugged country. -Thick game stew..made with hare,rabbit,wild boar or venison(and chicken if game is lacking). 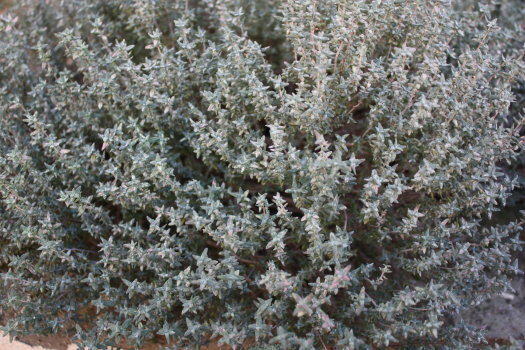 – Each stew recipe is a closely guarded secret by its cook but they all include the one magical ingredient:”pebrella” (Thymus piperella) which is a local mountain herb which can only be found in the aforementioned areas. It is very hard to find outside of these places, and is now illegal to pick. Locals here, over the years,whenever we talk about “pebrella”, lean in towards me and lower their voices and say there is a rife black market for this ingredient and if I want some then etc etc……..Herb trafficking somehow sounds ridiculous(and ambivalent) but the fines for picking protected species can be very stiff. Funnily enough, caliqueños( a local cigar) are also traded on the black market. -Unlevened bread is put into the stew producing a pasta type texture to the hard bread. 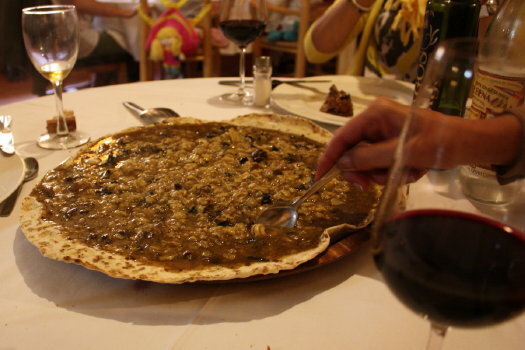 -And in some places they serve the stew (with a bit of unlevened bread in) onto a large round unlevened bread which is a little like a thick pizza base. -Mountain snails are optional….personally prefer without! 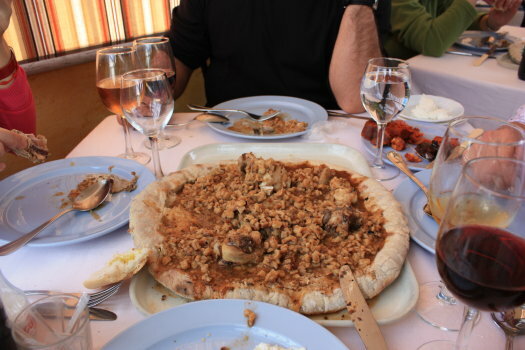 You, then communally eat from this round plate in the middle of the table.After finishing the stew, as the base is very large and thick, most of it still remains and this is where the unexpected comes in. Locally made honey is then poured onto the base and you finish it all off as a sweet. 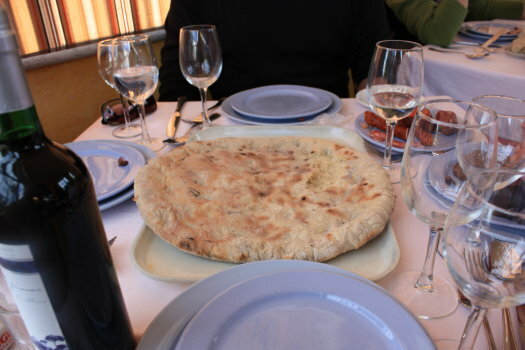 The ingredients of the stews vary according to which town,village,restaurant or house you are in; even the thickness and type of unlevened bread varies but the “pebrella” is an obligatory part of the dish and makes it geographically and culturally part of this lovely rural part of Spain. What wine to drink with this unique feast? Well,undoubtedly, local red wine,which tends to be strong; maybe a “Maduresa” from Celler del Roure or “Sentada sobre La Bestia” which is spectacular both from the Fontanars dels Alforins area. Both Fontanars and Enguera produce some quite fantastic full bodied deep dark cherry red wines which are perfect for combining with this dish. This entry was posted in Spain, spanish food and tagged authentic Spain, cooking, Food, local dishes, mountain culture in Spain, regional food, rural spain, Spain, spanish culture, tradition, tradition spanish recipes, Travel, wine by Paddy Waller. Bookmark the permalink. Great post, Paddy! I love the sound & look of this dish, especially on a cold night like this! Thanks Sue for dropping by. It is indeed great food for cold days! This dish sounds quite delicious. It made me think of another traditional dish, not so delicious (to me) in Armenia: Cow foot soup. It’s a rather liquidy affair with pieces of cow foot in it and you add toasted flat bread to it and it ends up rather soupy, but still not that good (to me) . . . I think I would prefer your Spanish dish! Wow Cowfoot soup…I think I agree this Spanish dish sounds so much better!! Somehow cowfoot soup doesn’t sound too appetising!! Here in Spain pigs trotters are a big favourite as are chicken feet in some rice dishes but not really into feet of any sort myself! Thanks for dropping by and commenting!